Climate change is real, and it is impacting the planet every day. Everyone has a responsibility to safeguard the environment, and you can start in the comfort of your own home. This means proactively recycling, reducing pollution, and minimizing your water and energy consumption. Doing so cannot only help to protect the environment, but it can also help you to make significant monthly savings. Here are five ways to go green and save money. If you want to create a sustainable earth, reduce your water usage by installing a low flow shower head. Doing so will not impact your daily routine and your water pressure should stay the same or improve with today’s advanced products. Not only will you be conserving a considerable amount of water throughout the year, you’ll spend less each month on your water bill which can add up quickly. Incandescent light bulbs not only consume much energy, but they regularly need to be replaced. Switching to LED lights has the potential to save you hundreds or thousands of dollars during their lifespan, as they can last for up to ten years, and will significantly lower your home’s energy consumption. Also, as the lightbulbs can last for up to a decade, you won’t have to regularly pay for new lighting. Unfortunately, transportation causes a whopping 27% of greenhouse gas emissions, which are destroying the planet. Therefore, you must aim to reduce your carbon footprint as much as possible. If you want to minimize your impact, you should consider finding alternative ways to commute to work, visit a loved one, or go shopping. For example, you could walk or cycle to work. If this isn’t an option, consider using public transport or carpooling with a colleague. Each alternative will save you a substantial sum every year, and walking and cycling will improve your health, too. Trees are one of the best ways to fight climate change, as they absorb the harmful CO2 in the air, which they will combine with water to create oxygen. Planting a large tree in your garden could potentially provide enough oxygen for four people in one day, and native trees can support your local habitat. So, how do trees help you to save money? They can provide you with more shade in your garden, which can reduce your reliance on expensive air conditioning on a hot day. What’s more, trees can also increase your property’s value, so they are definitely a must-have in your outdoor space. Many people make the mistake of thinking their gadgets are not using electricity when turned off. Yet, they will use phantom power when plugged into a wall, which can drain your bank balance. Stop impacting the environment and your finances by using a power strip, which will completely turn devices off at night or when you leave home. You can trust you’ll notice the difference on your energy bill. P.S: Thank you very much for reading this article. Please post your questions or comments below. 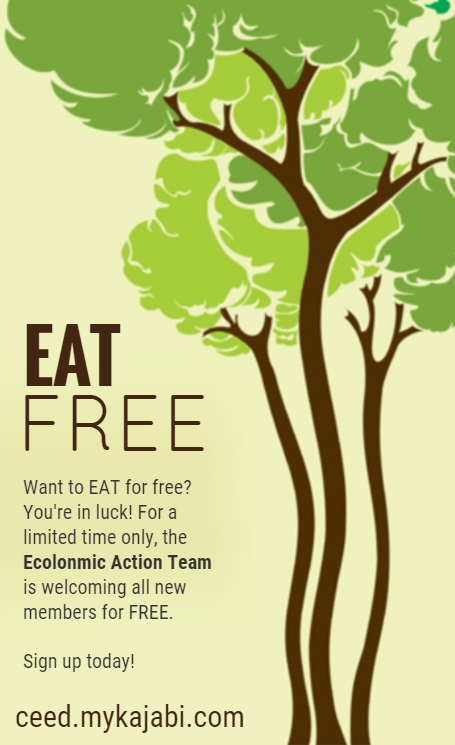 To learn more, please join our EAT Community, where you can make some money, making the planet better.